F-16 Fighting Falcon ist eine hervorragende Flugsimulation für alle, die gerne Bomben abwerfen und im Tiefflug durch die Landschaft donnern. An König Tornado kommt F-16 nicht ganz heran, da dynamische Kampagne und Autopilot fehlen. Abgesehen davon ist F-16 eine ausgereifte Flugsimulation, die sowohl Einsteiger als auch Vielflieger begeistert. Im Vergleich zum ebenfalls vor Kurzem erschienenen iF-22 ist F-16 die bessere und vor allem fehlerfreiere Simulation. Damit hat F-16 Fighting Falcon meine ganz klare Kaufempfehlung. 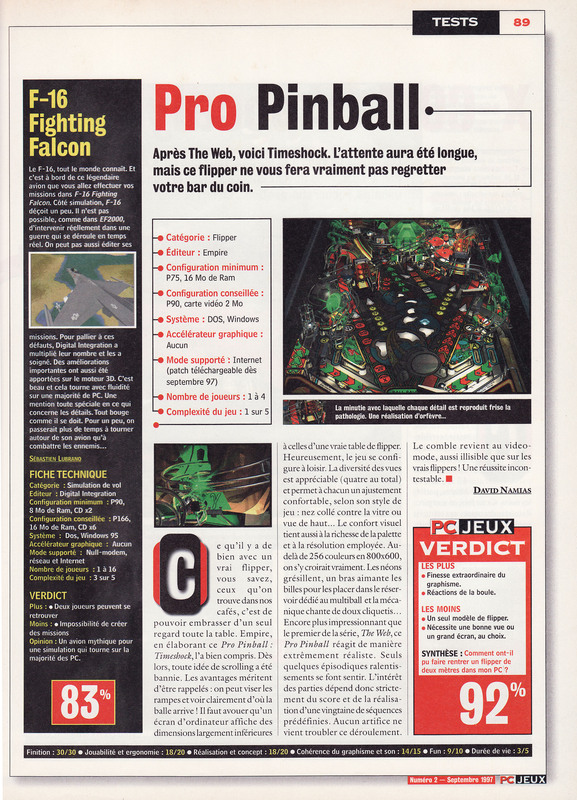 Un avion mythique pour une simulation qui tourne sur la majorité des PC. Die Simulationen aus dem Hause Digital Integration zeichnen sich allesamt durch hohe Spielbarkeit und eher schwache optische Präsentation aus. Bei F-16 Fighting Falcon haben die Entwickler aber auch die Grafik nicht völlig aus den Augen verloren. So wirken die Landschaften erheblich ansehnlicher, als noch in Hind. Allerdings sind sie immer noch nicht so attraktiv, daß der hohe Hardware-Aufwand gerechtfertigt wäre. Comanche 3 ist auf jeden Fall um Klassen hübscher, aber nicht so viel langsamer. Schade auch, daß die Gegend über weite Strecken so unbelebt ist. All in all, it seems that while this is an enjoyable simulation, certain aspects of it keep it from being slightly better than average. The graphics, while good, do not compare with some of the higher end sims available on the market now. The flight model seems too touchy to be realistic. Everything else about the game is wonderful - especially the missions, but it's still not enough to make the game really stand out. Bottom Line: Excellent training, missions, and campaigns. Graphics, while good, are below what is becoming the norm today. Extremely touchy controls require quite some time to adapt. Die Missionen sind zahlreich, die Gegner knackig schwer und der Komplexitätsgrad hoch. Vor allem der richtige Umgang mit den Waffensystemen will erstmal gelernt werden. Manchmal hätte ich mir ein etwas ausführlicheres Handbuch gewünscht. Die knapp 100 Seiten reichen bei weitem nicht aus, um alle Fragen zu beantworten. Wer aber weiß, wonach er sucht, wird (wenn auch extrem knapp) informiert. Und da die deutsche Lokalisierung rundum gelungen ist, werde ich mir die Wartezeit auf Spectrum Holobytes Falcon 4.0 mit F-16 Fighting Falcon angenehm vertreiben. De software is je aankoop misschien waardig als je echt je tijd erin wil investeren en de povere graphics er wil bijnemen. Wie al dat technisch gegoochel niet zo ziet zitten en die liever een eenvoudige vluchtsimulator wil met knappe graphics, kan beter aan Fighting Falcon voorbij lopen. Despite the numerous graphical and interface problems previously mentioned, iF-16 has a good flight model with a very realistic feel to it. Some of the best flight sims started out good and then became great after the needed patches were released (Falcon 3.0). I believe iF-16 is starting out average but could become good with the appropriate fixes to some problems. Interactive Magic has an opportunity to make this a good flight sim. iF-16 doesn't offer many of the new features that we have come to expect in today's flight sims such as satellite terrain mapping, 3D video support and Internet play. It should provide a few weeks of enjoyment, but because of the many missing features and limited missions, it may end up in your next garage sale sooner than you would like. iF-16 is essentially a marriage of the most often simulated combat aircraft in history with a slightly tweaked version of the APACHE/HIND engine. It brings almost nothing new to the table. This is not to say that it is a bad game – originality isn't everything, and the game can be fun to play. But at a time when every new flight sim promises to be bigger and better, iF-16 must resign itself to having mediocrity as its defining trait – is is neither especially good nor especially bad at anything.